Louisiana Cajun Mansion Exclusive "Packages"
Make your stay an over-the-top experience with our impressive in-house exclusive packages! It's the little things that count. Make your stay at the Louisiana Cajun Mansion a memorable experience. Setting the mood with this Romance Room Package! It's all you'll need to set the tone and start your get-away in the right direction. Imagine your partners expression when they walk in and they see rose petals on the floor that lead them to all the rose petals on the bed! Once they've got over that.... There's chocolate covered strawberries and perfectly chilled champagne waiting to be enjoyed. 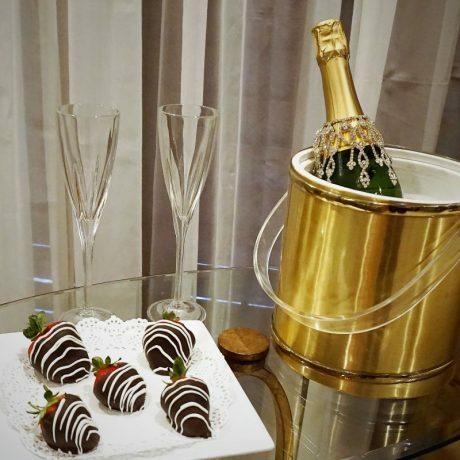 CHAMPAGNE & CHOCOLATE COVERED STRAWBERRIES – The Romantic Getaways usually begin with Chocolate Covered Strawberries, a perfectly chilled bottle of Champagne and Rose Petals on the bed. It awaits you in your bedroom suite for when you arrive. ROMANTIC COUPLES MASSAGE – Next comes the Romantic Couples massages; it’s typically a 2 hour romantic event in the privacy of your own room. The massages at the Mansion are not like other couples massages you usually get. Imagine this…. soft music is playing in your bedroom suite, one of you is on the table and the other is relaxing on the soft luxurious chair. The person on the chair is experiencing a hot foot bath with jets, warm aroma therapy shoulder pads with cool compresses over their eyes. Fresh Infused Water is in a glass near you; perfect for hydrating! The person on the table experiences their massage first and when done, you change places. You’ve been issued luxury waffle & terry robes to wear and it makes the experience even more romantic. When your couples massage is complete, there’s no need to rush off anyplace. Relax in your suite, in the large living room or at the pool. You’ve got choices and relaxing is on the top of the list. ROMANTIC DINNER IN THE WINE ROOM – The Romantic Dinner is the Wine Room is an over the top dinner that usually lasts about 2 hours. It’s normally served around 7pm, but that time is catered around YOUR schedule. It’s a 5 course meal served one course at a time and the ambiance is just perfect. Image this…. First you’re greeted by your server who welcomes you to your Romantic dinner and then you are escorted to the stunning and romantic wine room. Soft music is playing and the room is filled with candles, glasses from Wineries are displayed, Wine is for decor only and not available for sale. You'll enjoy a 5 course meal that is served one at a time. It's ok to bring your own wine! LATE NIGHT SWIMMING AT THE POOL – Your 24 Hr TURBO Date night isn’t perfect without your late night swim! Imagine completing your night by swimming under the stars in a private beautiful back yard. Everything you need is right there and available for you. Stay as long as you like; remember this night is all about you. HANGING OUT AT THE POOL TILL 2PM THE FOLLOWING DAY – When you think you have to checkout like everyone else, it just gets better! Before running back to the kids, work and the rat race of LIFE, considering hanging out a little while longer at the pool after breakfast. Stay there till 2pm if you like; just need to check out of your room by 11am. Want to WOW your partner? It's no secret, if you are here, you are probably wanting to be more romantic, compassionate and loving towards your partner. It's actually real simple; pick the package you want and we'll do all the work. We work with you ever step of the way to make sure everything is handled timely; ON YOUR TIME. Everyone loves being surprised; and when you do it with class, you've hit a home run. Everything is coordinated ahead of time so that all your food and beverages are set out right before you arrive. Your special dishes are prepared fresh the day of your arrival and is presented perfectly. We love paying attention to detail! Champagne, Chocolate and Red Roses are an integral part of any love story. Imagine walking into your weekend get-away bedroom suite and setting the mood with a dozen of beautiful red roses. Love comes in the form of luscious strawberries, all hand-dipped in real chocolate and sprinkled with a little extra goodness! 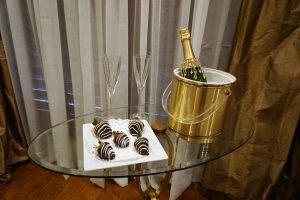 Champagne and chocolate covered strawberries are a close second to any romantic occasion and have always been favorites too! Image Chocolate Covered Strawberries being glistening ribbons of creamy comfort! They are crispy and refreshing and will delight anyone; most everyone are chocoholics, so you can't ever go wrong with this one. You'll want to have a little food in your bedroom suite. 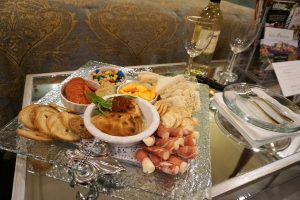 Enjoy an appetizer tray with a variety of cheeses, Prosciutto, nuts. We even make fresh petite sandwiches and a warm Bri Pie with homemade Pepper Jelly! It's everything you'll need for your perfect weekend and best of all, it's right at your fingertips. A Couple’s Massage can set the tone for a romantic spa-going experience for two because it’s designed to be shared with a significant other. Two hours of romance and relaxation with your special person. 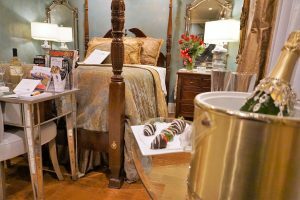 Imagine walking into your bedroom suite with soft music playing with a perfectly chilled bottle of champagne and chocolate covered strawberries waiting for you. Then when you think the ambiance couldn't get any better, your sweetheart notices her long stem red rose laying on her massage table. Seated in a plush robe, one person enjoys a massage while the other enjoys a totally relaxing heated foot bath, a warm aroma neck soother with a cool aroma face compress for relieving tight muscles and relaxing tired feet. Complimentary cold infused water is also available. You swap positions when the first massage is complete. Totally romantic and relaxing. Complimentary Spa Robes for massage only. Complementary heated foot bath with rotating jets and pumice stone. Relax while relieving tight muscles and relaxing tired feet. Complimentary warm aroma neck soother plus cool aroma compresses over your eyes before or after your full body massage. Upgrade Your Stay With Any of These Packages! 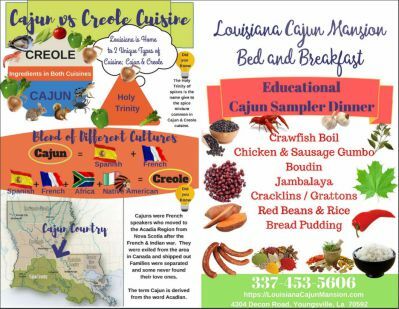 Simply book your Louisiana Cajun Mansion suite and add any of these packages to make your visit unforgettable!